GRAFFITI MURALS SCARY MONSTERS! 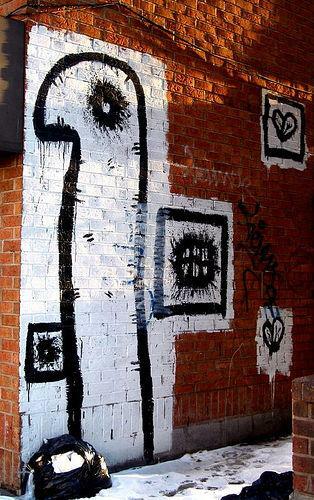 My first street art experiments started in the spring of 2002. I came up with these really simple creepy creatures while practicing with tempera paint on the sidewalk. This was really fun as I was able to meet and talk to a lot of people from the neighborhood in a casual way that couldn't be achieved in the gallery setting (I know most artist’s want to be put on a pedestal for their “genius” but in my experience that’s is generally a waste of time, you can’t learn anything if all you desire is to be worshiped for being pretentious, if you don’t believe me just look at how useless and boring most celebrities & artists are these days!) After a few tests on the walk ways I figured that these monsters could be made quickly enough and were ugly enough to take the streets. That spring I spent many a night running around the city splashing black paint all over in alleyways and construction walls throughout the city of Toronto. The images on this page are all from those early renegade missions and were taken in and around Toronto’s China town and Kensington Market area. I chose numerous back alleys as my canvases for two reasons; social awareness and artistry. First of all I didn't want to destroy anybody’s storefronts or visible property, despite the general attitude of graffiti artists I find no pleasure in causing other people trouble ( I mean really guys go hit city hall or a Starbucks if you want to make a statement but a local shop owners window or a family run business? 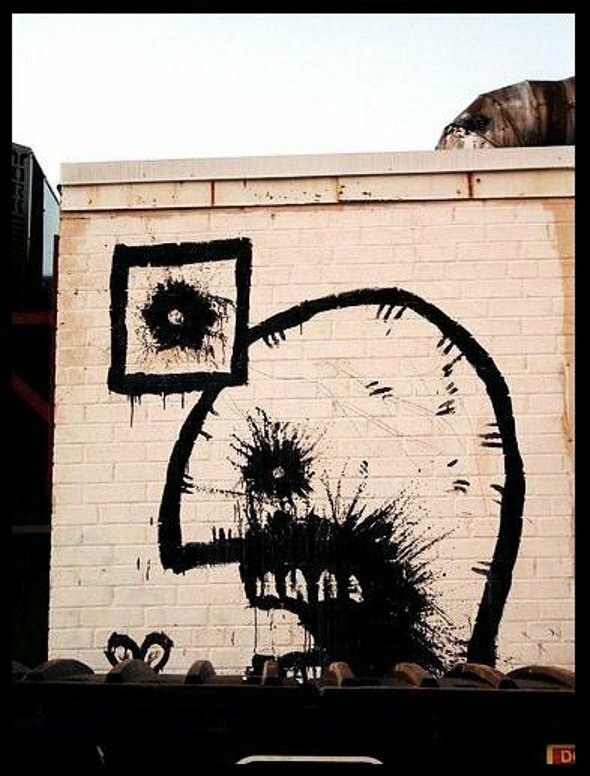 One too many huffs of the spray can me thinks). 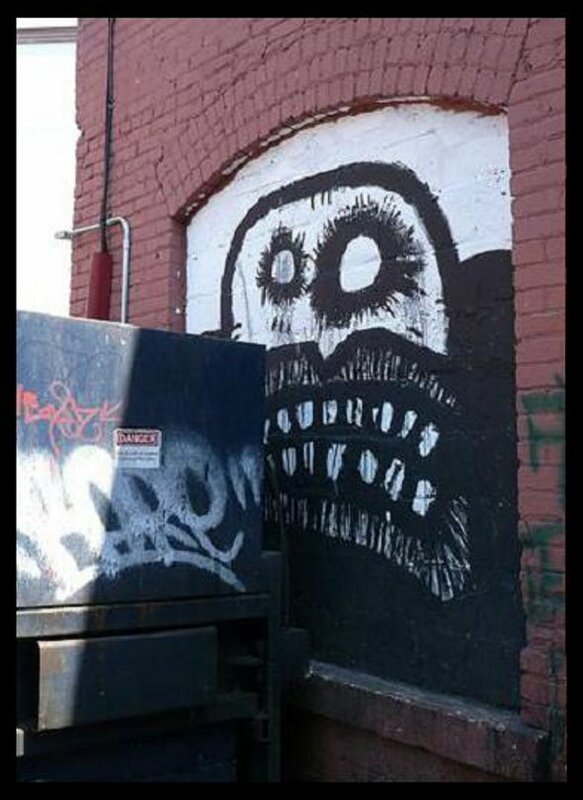 The second reason was for effect, I really liked the idea of these creatures peeking out from behind garbage dumpsters and the far ends of creepy alleyways. 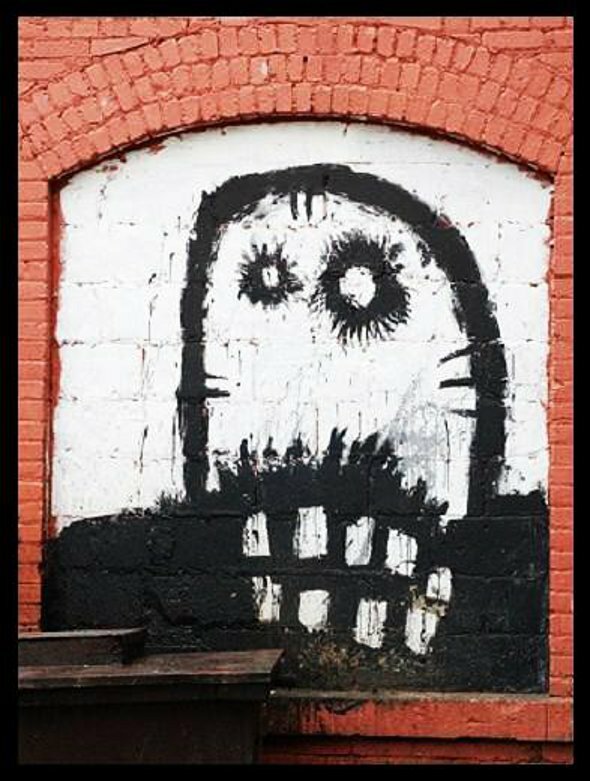 While all these images are from the winter of 2002 I've continued to paint these characters on walls, in animations and comic books ever since. More of these Scary Faces Monster Murals here!